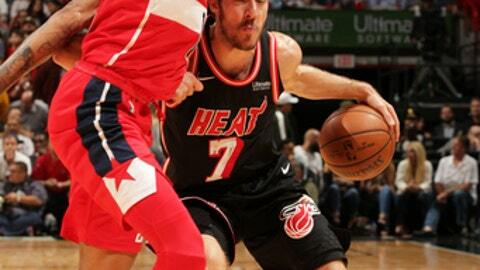 MIAMI (AP) Everything was going wrong for the Washington Wizards. They were facing their biggest deficit of the night early in the fourth quarter and were showing signs of unraveling. And then John Wall restored order. Wall scored 27 points, Bradley Beal had 26 and the Wizards overcame a dreadful third quarter to beat Miami 102-93 on Wednesday night – finishing the game on a 29-13 run that started when their point guard returned to the game with 9:47 left. ”It’s all about the guys doing a little bit more,” Washington coach Scott Brooks said. Wall didn’t have a great shooting night – 9 for 21 – but he was dazzling. Behind-the-back dribbles to freeze defenders on the way to a layup, tapping the ball through Hassan Whiteside’s legs to start a fast break, and getting a chasedown block of Tyler Johnson’s dunk try in the final minutes were just some of the entries on Wall’s highlight reel. Markieff Morris scored 15 points and Otto Porter Jr. finished with 12 points and 13 rebounds for the Wizards. Goran Dragic scored 21 points for Miami. Dion Waiters finished with 19, Tyler Johnson had 15 and Hassan Whiteside scored 14 points and grabbed 21 rebounds for the Heat, who were 4-0 against the Wizards last season. Miami led by seven early in the fourth, but lost in large part because of 17 turnovers that led to 26 Washington points. Heat coach Erik Spoelstra wasn’t thrilled about free-throw discrepancies – Beal was 13 for 14 and the Wizards were 29 for 31, while Miami was 16 for 19 – but insisted afterward that giving the ball away is a bigger problem. Beal put the game away with four free throws with 1:23 left, the first one coming after Johnson got called for a technical and the next three after getting hit by Waiters on a 3-point try. Down by as many as 13 in the first half, the Heat found their defense in the third quarter. Washington missed its first nine shots after intermission, Miami outscored the Wizards 25-10 in the third and the Heat took a 74-71 lead into the final 12 minutes – only to the game slip away. ”Guys are upset,” Whiteside said. Wizards: Beal shot 3 for 5 in that rough third quarter for Washington, and his teammates combined to shoot 1 for 14 in those 12 minutes. Porter and Morris were 9 for 11 in the first half, then 0 for 5 in the third. … Morris fouled out with 5:04 left, then picked up his second technical foul of the quarter for good measure and was ejected as well. Heat: Whiteside had eight rebounds in the first quarter, then eight more rebounds in the third. … Dragic has at least one 3-pointer in 15 consecutive games, tying the longest streak of his career. … Miami started 10 for 10 from the line. … James Johnson’s struggles continued, and he was 1 for 5 in 27 minutes. The Heat announced that forward Okaro White will have surgery Thursday to repair a fractured left foot. White was injured during practice on Tuesday. He’s averaging 3.3 points in 13 minutes per game this season. No timetable has been set for his return, but White said he’ll need at least 4-6 weeks before he can even put weight on the foot after surgery. Washington outscored Miami in each of the first two quarters, and that meant the Wizards were 13-1-1 in their last 15 quarters spanning parts of five games. The Heat outscored Washington by 15 in the third quarter. The teams meet again in Washington on Friday night. It’s the first time the Heat and Wizards have played consecutive games since 2004-05.